Sitting on San Francisco Bay between San Francisco and San Jose, the lovely town of Menlo Park is right in the middle of everything the Bay Area offers. Its biggest claims to fame include Google being founded here in 1998, and it's also the home of Facebook's world headquarters. Menlo Park is also a great place to live for commuters heading to any of the Bay area's major cities. Read more about living in Menlo Park. 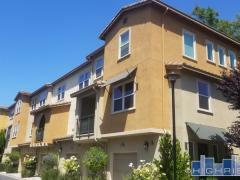 Below you'll find all the condos and townhomes currently available for sale in Menlo Park, Ca. If you'd like to expand your search to include single family homes you can also view all Menlo Park Real Estate for sale. For education, there are three elementary and middle school districts, and one high school district covering Menlo Park. The nine elementary and middle schools are divided between the Menlo Park City, Ravenswood, and Los Lomitas districts, while the three area high schools are part of the Sequoia Union school district, which also covers nearby towns such as Atherton, Palo Alto, and Redwood City. Most of this area's schools are considered among the best in California, and with great colleges such as UC-Berkeley and Stanford nearby, you can be sure your children will have a great education from start to finish. Besides the excellent schools, there's a lot that Menlo Park offers its residents. The Menlo Park Community Services Department is responsible for managing the town's parks, gyms, community centers, the Menlo-Atherton performing arts center, and even child care centers. They also organize many great events throughout the year such as the Halloween parade and carnival, the Multi-cultural festival in May, and the Fremont Park summer concert series, which are perfect for the whole family. The performing arts center also hosts many events throughout the year, such as concerts by local artists, lectures, and even movie sing-alongs to enjoy. There are also other great events organized by area businesses year-round, and of course the Bay Area is full of things to do for all ages.